This, my friends, is summer on a platter. So you’ve probably noticed that I don’t post many recipes ’round these parts. And there’s a very good reason for that: I only want to post the really, really good ones. Which seems to be working out nicely, since the last recipe I posted – my Creamy Coconut Curry Red Lentil Dahl – has been met with rave reviews from everyone who’s tried it. It’s been a loooong time since I’ve posted a dessert recipe, and I’ll admit, this one took me some tweaking before I got it perfect. Luckily, the strawberries keep coming every week in my CSA box, so I’ve had plenty of opportunities to experiment. Strawberry shortcake is a summer standard, and one of my favorite celebratory desserts. 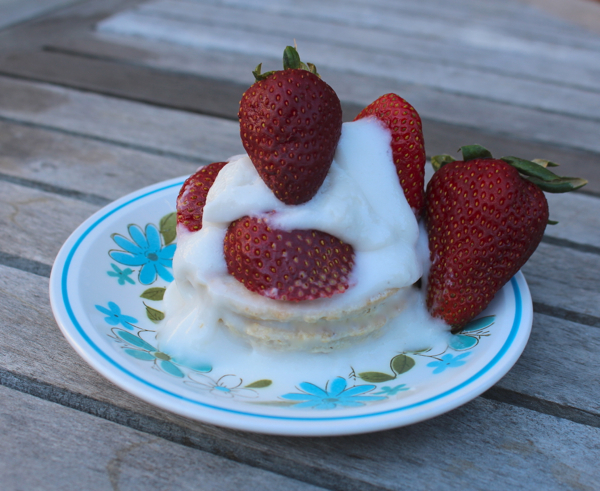 This particular recipe uses the denser, shortbread-style base (there’s a “biscuit” versus “fluffy cake” debate in the strawberry shortcake world, dontchya know) smothered in perfectly ripe, perfectly sun-kissed strawberries and topped with decadent raw coconut cream. I like my shortcake airy but firm, like a sweeter breakfast biscuit. And this gluten-free vegan version does not disappoint! 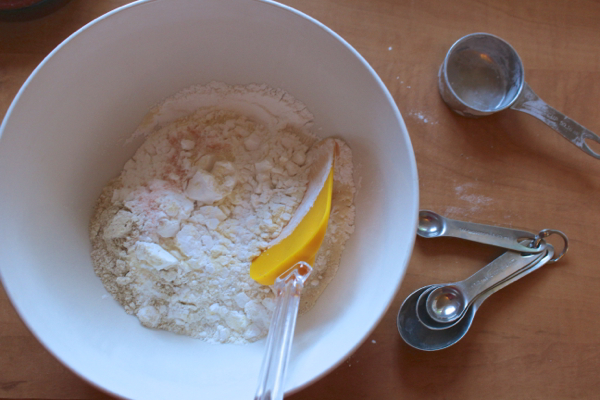 In a large mixing bowl, combine the flours, starch, baking powder, xanthan gum, and salt. Mix well to combine. Add the solid coconut oil and use a fork to “cut” it in, until you have a crumbly mixture. 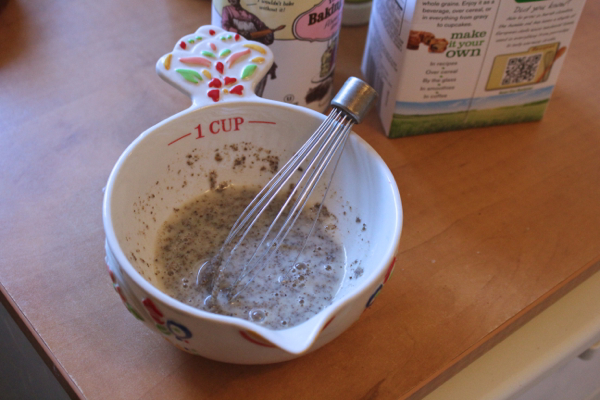 Add the chia egg, vanilla, sweetener, and alt milk, mixing thoroughly. On a floured surface, use your fingertips to pat out the dough, pressing it gently until it’s about an inch thick. 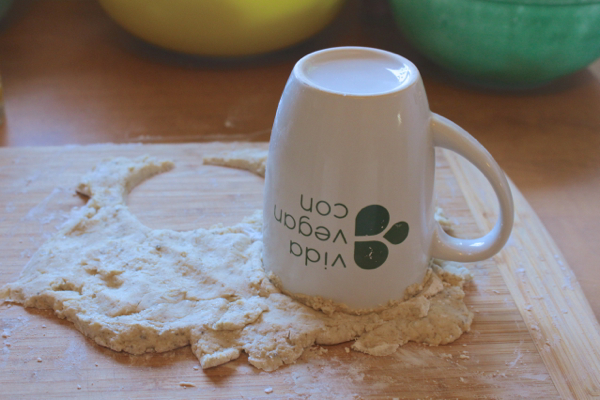 Use a biscuit press – or an old con cup – to form the dough into 9 or so rounds. This is a pic of my first batch, which I made too thin. The dough should be thicker than this! Lay out the rounds on a cookie sheet lined with parchment or a Silpat, and bake at 400º for 12-15 minutes, until golden. Allow to cool a bit before serving, but these are best when served the same day. No traditional strawberry shortcake would be complete without cream, preferably of the “whipped” variety. And for my cream I used fresh young Thai coconuts. I simply cracked the young Thai coconuts, poured the coconut water into a large bowl, scooped out all the raw coconut meat, and dropped it into the blender. Then I added just enough of the coconut water to be able to get everything blending. This works best if you have a high-speed blender like a Vita Mix or Blendtec. I did 4 coconuts because I like making big batches, but you could do as few as 2. After it’s blended to a thick cream, you can serve it as is (the coconut water sweetens it, but of course you can also add a liquid sweetener, like maple syrup, coconut nectar, or agave if you want), or you can do like I do and culture it overnight to make a raw coconut yoghurt. And just a helpful note from Captain Obvious, if you want to serve cultured cream with your fresh-baked biscuits, you’ll need to process the coconuts the day before. To make cultured cream, simply open a capsule of probiotic powder as the coconut cream is blending, so that the probiotic gets well dispersed. Then pour the cream into a large bowl, cover with cheesecloth or a nut milk bag (or clean kitchen rag if that’s all you’ve got), and set it out overnight in a warm-but-not-hot dark place (kitchen cabinets are great). 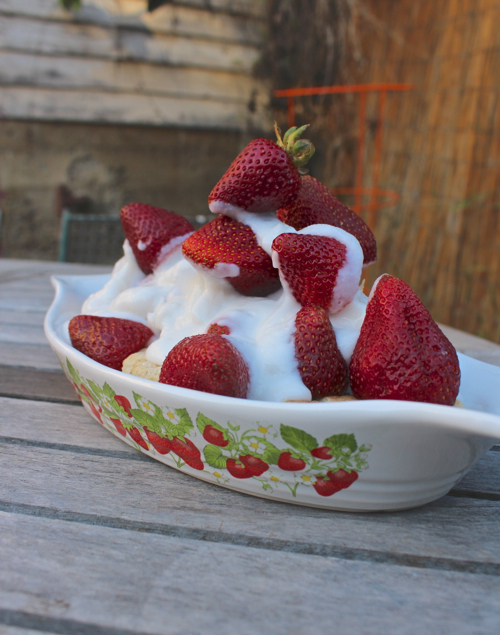 What you’ll have the next day is essentially raw living coconut yoghurt, an amazingly nourishing, sweet and thick and tangy topping for your strawberry shortcake. It’s also great for breakfast, and backs a probiotic punch that’s great for your digestion and immune systems! 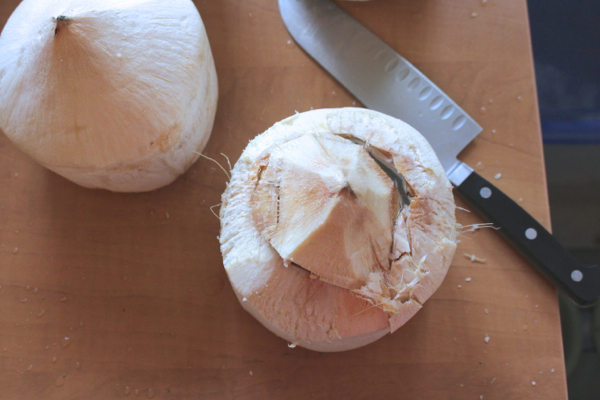 Raw cultured young coconut cream is possibly one of the healthiest foods on the planet. Truth. BUT, if all that seems like too much work (cracking coconuts? are you crazy??! ), you can also make some simple whipped cream using store-bought canned coconut milk (directions here, scroll down to the bottom). Or, ya know, you can just use whatever store-bought vegan whipped cream you prefer. 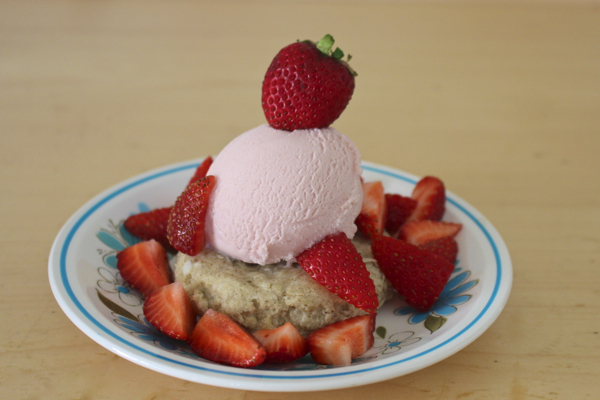 And just a heads up for the nontraditional types, these shortcakes are also excellent topped with vegan strawberry ice cream + fresh strawberry slices. If I’m being honest, I may have actually liked this version best of all! OMG that looks soooo good! I’m going to have to see if I can find the ingredients for this here (although I already know nowhere carries Thai coconuts, booo!) Also, I need that dish, my new kitchen is going to be done in strawberries, lol! You live in a magical land filled with all the food! I don’t think there is a single place in central Indiana that carries young Thai coconuts. Maybe the international market, but that exists in an industrial wasteland inaccessible to cyclists. Boo! It looks so good, too! My CSA also continually brings strawberries, and I am obsessed! I cannot wait to make these. Maybe this is a silly question but, I thought if anyone would know it would be you. Is the calyx of a strawberry toxic? I have heard it both ways…that it is because it is in the rose family; and that it is not. Since you are talking strawberries and since you picture the greens, I am hoping they are fine to consume?? Huh. I never ever thought about that, but I throw them into my smoothies all the time and I’ve never felt anything off afterwards. I’ve wondered but forgotten to ask until now – did I miss a discussion from you about your decision to eat gf? I’m doing it myself (aren’t we all?) even though I’m not celiac (about which I’m positive – I got a biopsy) and I feel SO MUCH AWESOMER. I am not one to hop on dietary bandwagons easily, but I am all on board with gf eating FOR MYSELF. I’m sure I and others would be interested to hear about your decision, if that’s something you felt like sharing. I’m okay with fewer recipe posts if it means they’re all as perfect, delicious and detailed as the ones I’ve tried from B.A. :) Great content, and I love “hearing” your voice as always! If you can’t get young Thai coconuts, the canned coconut milk works really well, and it’s delish. 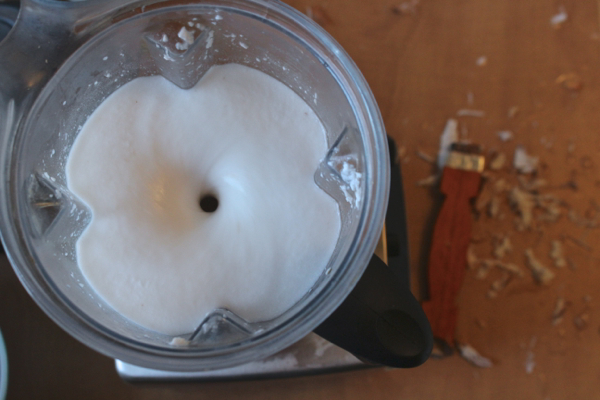 Anyway, you can totally make whipped coconut cream out of canned coconut milk, and it’s super rich and delicious. Definitely worth a try! Yay! Let me know how you like ‘em! Definitely not poisonous! I’ve been known to toss them into smoothies and juices, and I also use strawberry leaves in my homemade fermented pickles (the tannins keep the pickles perky). So no worries – you can much ‘em! This is an excellent idea, especially with the recent kerfuffle about non-celiac gluten insensitivity and FODMAPs and such. I wrote a little about my experience in my Facing Failing Health post, but I’ve never addressed it directly in its own post. However, I have a LOT to say on the subject, and I think you’ve just inspired me to finally sit down and get it all out. So thank you! Awesome! I can’t wait to read it. FODMAPs is my issue, as far as I can determine. (I cannot tell you how much my IBS has cleared up since eliminating onions, garlic, and wheat; those seem to be my major FODMAPs offenders). Your perspective on the whole thing will be great to read! It does seem scary, but remember that not everyone will react to all of the FODMAP foods in the same way. I was SO SCARED that beans (a daily staple of my veg diet for 20+ years) would be a problem, but they’re not. So, we don’t necessarily have to fear legumes if we have IBS. My probs are onions, garlic, and wheat; restaurant eating is difficult, but that isn’t a veg-specific problem – otherwise, I eat a totally normal veg*n diet without the specific FODMAPs that bother me. We each have to do the FODMAPs elimination diet for ourselves. Very true! I was recently diagnosed with IBS after fighting with my doctors about it for years. I am still in the FODMAPS elimination phase but I am pretty sure that beans, especially soy, are an issue for me. And possibly other grains as well (paleo helped in a different way, for example). I was sort of hoping there was some other vegan form of protein I was forgetting about buuut I don’t think there is. What I am really hoping happens is that, after going off FODMAPS for a few years, my gut heals and I can eat higher-FODMAPS in moderation, so at least I don’t have to totally rely on animal products for protein.. plus kraut and broccoli would be nice, I miss cruciferous veggies! Yeah, that’s a serious bummer and hopefully you can find ways to work it out with your own system. I think we can avoid grain and be fine on the protein front, but you’ll have to get creative with the beans/soy. I use a pea protein powder (do peas bother you?) and in fact I am PERSONALLY ovo-veg (not really lacto-) so I get protein from eggs too – about once a week. I really honestly believe that we can avoid meat and still get plenty of protein, and grains have nothing to do with that. I get 80-90 grams of protein a day, and only about 15 of that is beans, and basically zero from grains. I have also found that the problem for me isn’t actually gluten, but wheat itself. That means I can eat (some small-ish amounts) of seitan without much problem. Odd, but true. I think you’re right, though, in that a healed gut can start to reincorporate the things that bother it – so beans down the line might work for you. Good luck! Hi Theresa, I’ve never had a FODMAPs client (yet!) but I know it’s getting more attention and I’m currently educating me about the subject. You should check out this ebook, FODMAPs-Free Veg, it might be just what you need! I haven’t looked into peas – I thought that since they are technically in the legume family they had similar amounts of FODMAPs, but I’ll add them to the list, as well as seitan (I too think it’s the inuilin in wheat, not gluten, that’s the issue). Good ideas! Have you heard of hemp tofu? It probably wouldn’t work as your sole source of protein (booooring) but it’s a start, and it’s really good! I think I remember you mentioning it on the blog at some point? I’ll definitely look into it, yummy! Ooh, also quinoa, oats, and buckwheat are all FODMAPs-free. Quinoa and buckwheat are pseudograins, not true grains, so if you have to be grain-free for some reason, quinoa and buckwheat might still work. They’re both very high in protein, on par with beans/legumes. And oats, if you can do them, are great. A serving of oats has as much protein as a large egg! I will put those on my elimination-test list! I’m almost in grad school so I’ve been living off cheap rice and forgot other things existed, haha :) Thank you for the suggestions! How interesting! I know I just started on Stanford’s diet, which says that mushrooms and everything related to cabbage (including cauli), is out, as well as peanuts (legumes). So it’ll be interesting seeing what actually gets inducted into the Low/High FODMAPS lists. We’ll see how much energy I have, ideally it’d be good to do an elimination diet with everything that conflicts! Thanks for the link, blogs for some reason are the easiest way for me to absorb information! Hi Sayward! Thanks for the awesome recipe. I can’t wait to try this out ：）　Btw, your blog is THE BEST (really, without emphasis). 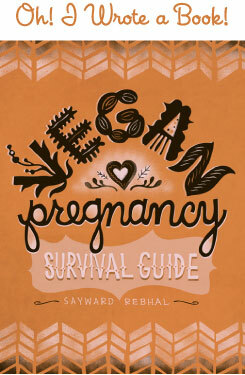 I love it that your blog is not only about the vegan FOOD but about conscious vegan LIFE. And what’s more amazing is that your blog is so “raw” and “real”. What I wanna tell you is that PLEASE make money from this blog because you deserve it!!!! (and I believe that can make your blog more active.) I totally understand your policy of not making this blog into “business”. But please remember that we all want you to continue this blog (hopefully with more frequent post!). I’m so sure that you’ll be always truthful whatever happens! I hope this doesn’t sound pushy. You’re literary making a big impact to the world, (and to the 17 y/o Japanese girl…excuse my poor English but really wanted to participate in this blogosphere ). Have a nice day! Thanks, Sayward. I am so glad to have a definitive answer. Best to you. Yea, losing garlic and onions has meant a complete overhaul of the way I cook and which restaurants I can eat at (now only ones who make each dish from scratch and will accommodate me – I’m now eternally grateful to the ones who do!). But since I feel one million times better–seriously, I used to have to hold my side while running to staunch the pain in my gut, but no more; I could go on with improvements I’ve experienced but some of them are, well, tmi-it’s all worth it! I used this book/website, and there’s a list here of high/low that puts peas in the low category: http://www.ibsfree.net/high-or-low/. But also LOW are tofu, tempeh, and canned chickpeas and lentils! I had forgotten that soaked/canned (because of the long soak) legumes are low FODMAPs!!!! I recall now that I decided I’d continue to eat beans and lentils anyway, but soak and sprout them if they turned up on my list – but since they didn’t, I forgot all about that! Awesome! I’ve been wanting to try it with coconut milk anyway, so now I totally have a wicked awesome excuse! I’ll jump in on the whole FODMAPs/ IBS convo! I’ve had IBS for years and tried numerous diets to help. I feel much better being vegan but still haven’t “fixed” it 100%. I did the FODMAP elimination diet for 7 weeks and continued it after that but after a few months I saw no change. I don’t know if you guys have heard of MRT testing? It’s been around since 2006 but experimental nutrition approach to stomach issues. Basically your body can have a delayed immune response to food, like 1-3 days later, and it can cause IBS and a range of symptoms. I had the test done a few months ago and turned out I react to almonds, peanuts, lentils and a few other foods. I have those foods a lot and now have to avoid them and I’m working with a certified MRT dietitian. I’m only in month 2 but noticed some improvement. Just an idea to check out if interested!